Step into a work of art as you visit the original home and studio of American artist Grant Wood! Grant Wood (1891-1942) was a prominent member of the Regionalist movement. His home and studio was located at 5 Turner Alley from 1924 to 1935. His spirit is still very much alive as visitors observe the decorative details and craftsmanship that went into transforming the loft into a studio, performance space, and living quarters. Visitors can stand in the very spot where Grant Wood painted some of his most famous works including American Gothic (1930). The Grant Wood Studio is a member of Historic Artists’ Homes and Studios, a program of the National Trust for Historic Preservation. The Grant Wood Studio is owned and operated by the Cedar Rapids Museum of Art, which houses the world’s largest collection of artworks by Grant Wood. A portion of those works are on currently on view at the CRMA, just blocks away from the Grant Wood Studio. Studio Hours: Open April through December on Saturdays and Sundays from 12:00 PM-4:00 PM. The Studio is closed on major holidays. Should there be inclement weather, please check the Cedar Rapids Museum of Art’s website at www.crma.org to verify the Studio hours of operation. Please note: While the Armstrong Visitor Center is handicapped accessible, the Studio is not. Admission: There is no admission charge during regular Studio hours. Free general admission has been underwritten by a grant from the Esther and Robert Armstrong Charitable Trust. A docent will be available to explain the Studio and to answer your questions. Directions: The Grant Wood Studio and Visitor Center is located at 810 Second Avenue SE in downtown Cedar Rapids, just three blocks from the Cedar Rapids Museum of Art. From Interstate 380: Exit 20B to Seventh Street. Turn left at First Avenue (the second stoplight after the off-ramp). Turn right on Tenth Street. Drive one block. Turn right on Second Avenue. The Studio is on the right hand side of Second Avenue shortly before the stoplight at Eighth Street. Bringing the world of art to Cedar Rapids and all of eastern Iowa! Over the past century, the Cedar Rapids Museum of Art has evolved into one of America’s great small art museums with a strong collection of more than 7,700 works of art. 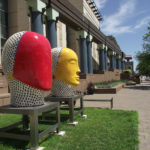 Each year, the Museum presents a diverse series of exhibitions as well as a wide variety of educational programs both at the museum location and the Grant Wood Studio which the CRMA owns and operates. The CRMA is located at 410 Third Avenue SE between Fifth and Third Streets in downtown Cedar Rapids. A free parking lot is available for visitors at our Second Avenue entrance. From Interstate 80: Take Interstate 380 North to Cedar Rapids. From Interstate 380: Take exit 20B. Go two short blocks to Second Avenue. Turn right. 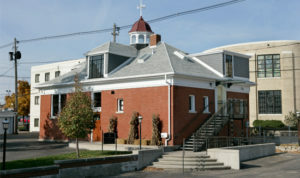 The Museum is located just past Fifth Street on the left side of Second Avenue. A free parking lot is also available at this entrance. Stop in the Museum Store to shop for a unique variety of items and great creations of Iowa, including books, jewelry, art-related gifts, and other creative items. Museum members receive a discount.